The town of Achziv (English Bibles use Achzib) is located on the Mediterranean coast of Western Galilee about 9 miles north of Acco (Akko, Acre = Ptolemais). This is in the northern portion of the Plain of Acco. Achziv was assigned to the tribe of Asher (Joshua 19:29; Judges 1:31), but Asher was not able to drive out the Canaanite inhabitants of the land. Achziv remained primarily a Canaanite or Phoenician town throughout most of biblical history. In exchange for cedar and cypress timber and gold, Solomon gave 20 cities in the land of Galilee to Hiram king of Tyre (1 Kings 9:11-13). That portion of western Galilee was called the land of Cabul. This is another indication that this region continued under the influence of the Phoenicians. King Hiram visited the cities but they did not please him. Sennacherib, king of Assyria (704-681 B.C. ), claims in the Taylor and Chicago Prisms to have conquered the cities of Sidon, the mainland city of Tyre, Achziv, and Acco. In New Testament times Achziv was known as Ecdippa (Ekdippon) (Josephus, JW 1.257). The map below shows the location of Acziv between Acco and the Ladder of Tyre. 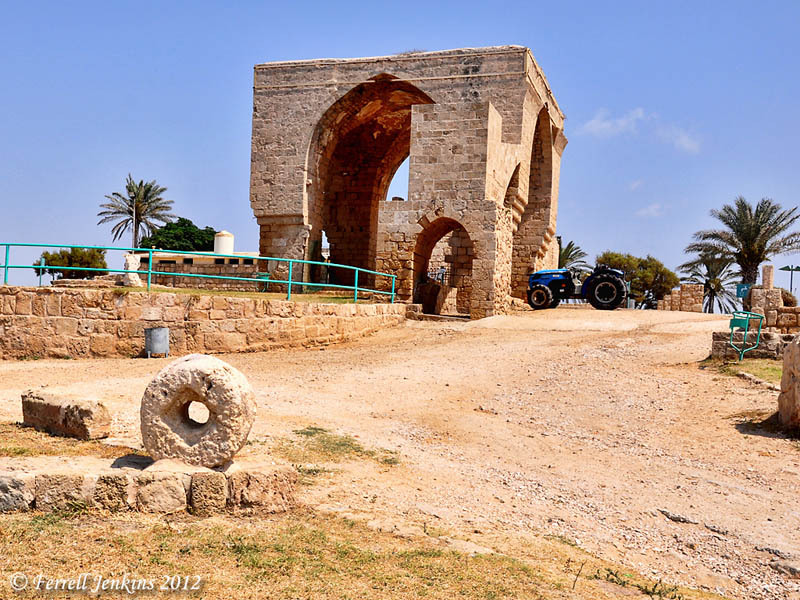 The Ladder of Tyre is a natural formation that has served as a border between Israel and Lebanon during many historical periods, including the present time. Achib (Achziv) on the Mediterranean coast of Western Galilee. BibleAtlas.org. The Crusaders built a fortress at Achzib and named it Casal Imbert. The Mamluk’s captured the site in 1271, and an Arab village remained there until the War of Independence in 1948. Achziv is built on a sandstone (kurkar) ridge overlooking the Mediterranean Sea. The remaining structures from the Arab period, now part of a National Park, are made from stones of the Crusader fortress. Arab period structures made from stones of the Crusader fortress. The Mediterranean Sea is in view when you reach the top of the tel. Photo by Ferrell Jenkins. 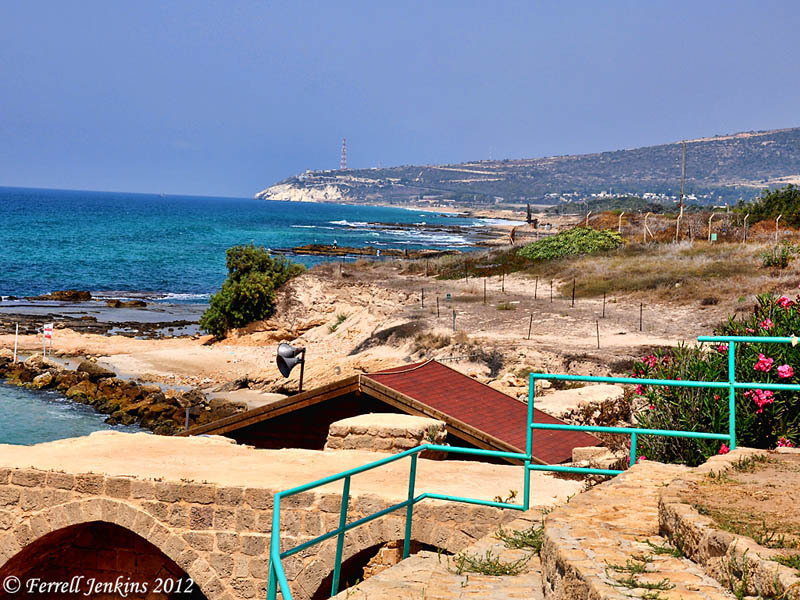 This photo was made from Tel Achziv looking north to Rosh Hanikra and the Ladder of Tyre, a distance of about 4 miles. The view north from Tel Achziv to Rosh Hanikra. Photo by Ferrell Jenkins. Some artifacts from Achziv are exhibited in the Hecht Museum in Haifa. For an earlier posts about this region, see here and here. This entry was posted in Bible Places, Bible Study, Israel, Old Testament, Photography, Travel and tagged Assyrians, Phoenicians. Bookmark the permalink. These pictures are unbelievable…. great post!